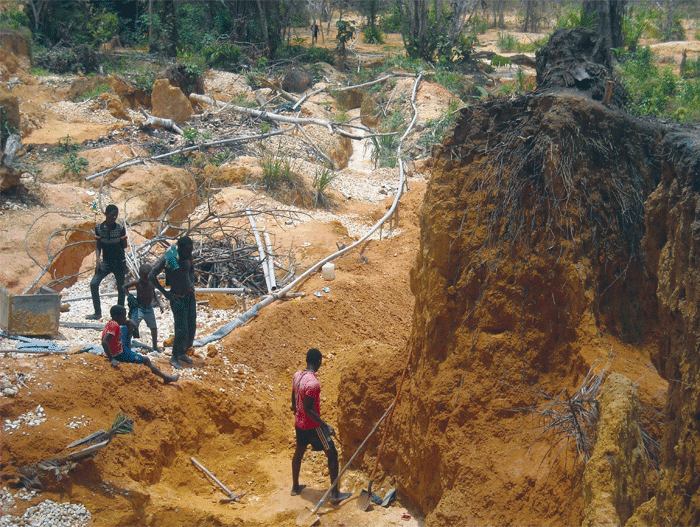 An increasing threat to tropical ecosystems is posed by artisanal and small-scale mining (ASM) for high-value minerals including diamonds, gold, tungsten, and coltan (a source of tantalum, used in cell-phone circuitry). ASM poses many of the same risks as industrial mining, including habitat destruction and fragmentation, pollution, and hunting pressure on wild animals. But while large-scale mining requires formal concessions and at least some measure of supervision by national or international authorities, ASM is generally informal and either illegal or a-legal, outside any regulatory framework. Where regulations exist they may be ignored or unenforced owing to corruption or lack of capacity and resources. The miners themselves are often exploited by the traders they sell to and unaware of the dangers of the use of toxic chemicals including mercury and cyanide. Additionally, mining camps in remote areas may serve as bases for illegal activities such as ivory poaching, bushmeat hunting, and live-animal capture. Various strategies have been proposed to mitigate the impact of ASM. Where it occurs illegally in formally protected habitat, eviction by force is the most direct approach, but keeping miners out permanently may not be possible. Without a robust program offering miners an alternative livelihood and/or an economic stake in respecting the borders of the protected area, eviction is likely to fail. In areas where mining is legal, valid approaches include negotiating access under rules established to minimize ecological disruption and incentives for responsible practices. Even small changes can greatly ameliorate negative impacts.